The full moon in Aries early morning on the 30th September will bring some harmonising energies together with the sun in Libra. We have already experienced the opposite energy combination back in April this year, when the sun was in Aries and the full moon in Libra, but due to the change, the energies of Libra and Aries influence each other differently. While we are working on creating balance at work and in our relationships by recognising the needs of others and exercising more tolerance (Justice/Libra), we also need to be aware of our own needs and ambitions (Emperor/Aries). Whilst we focus on the collective needs and greater good (Justice/Libra), we are challenged by new motivational energies - new ideas, visions and ambitions that help us grow, and this balancing act may create a sense of new beginnings ahead. be more spontaneous and use the momentum to resolve unfinished business. The easy-going energy of Libra/Justice may have led to a passive state of procrastination. Now is a good time to get things done again, especially for yourself. explore what is holding you back from achieving your goals, and let go of it, especially people, who don't offer you the support and encouragement you need. focus on being a driving force rather than blending in with the collective. Be more confident about your abilities; let go of the fear of making mistakes or not being good enough. 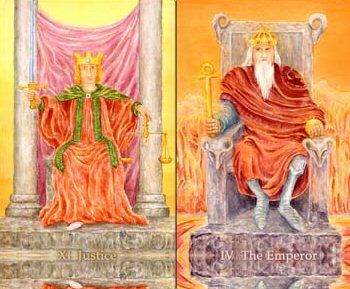 Meditate on the Emperor card to invoke the positive energies of the full moon in Aries over the next few days.